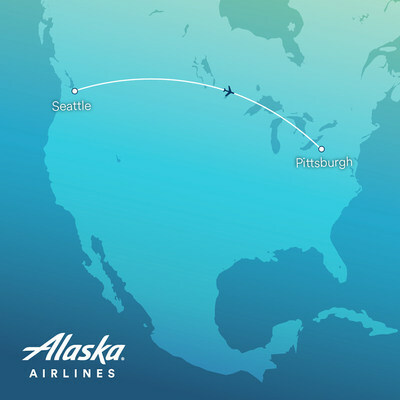 Seattle, Washington, 2018-Sep-07 — /Travel PR News/ — Alaska Airlines announced today (Sept. 6, 2018) that it will begin nonstop, daily service between Seattle and Pittsburgh. This new service is currently the only nonstop flight offered from Seattle-Tacoma International Airport to Pittsburgh International Airport (PIT). The new route effectively links Seattle to the thriving business community in Pittsburgh, which continues to grow as top technology companies, entrepreneurs and start-ups look to establish a presence in the city. Alaska is continuing to make investments in improving nonstop access from key focus cities, while investing in the onboard product with the addition of high-speed satellite Wi-Fi connectivity, free movies and chat, and the introduction of a new food and beverage program that embodies Alaska’sWest Coast vibe by featuring fresh and local ingredients and new selections of craft beers and local wines. This entry was posted in Airlines, Airports, Flights, Travel, Travel Services, Travelers and tagged Alaska Airlines, Christina Cassotis, flights, John Kirby, Pittsburgh, Rich Fitzgerald, Seattle. Bookmark the permalink.